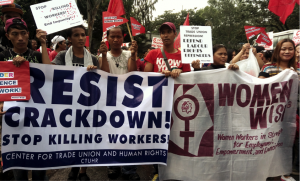 Twenty workers, trade union organizers and labour rights defenders had been extra-judicially killed since President Duterte came to power and wage its bloody and brutal wars on drugs, on terrorism and insurgency. 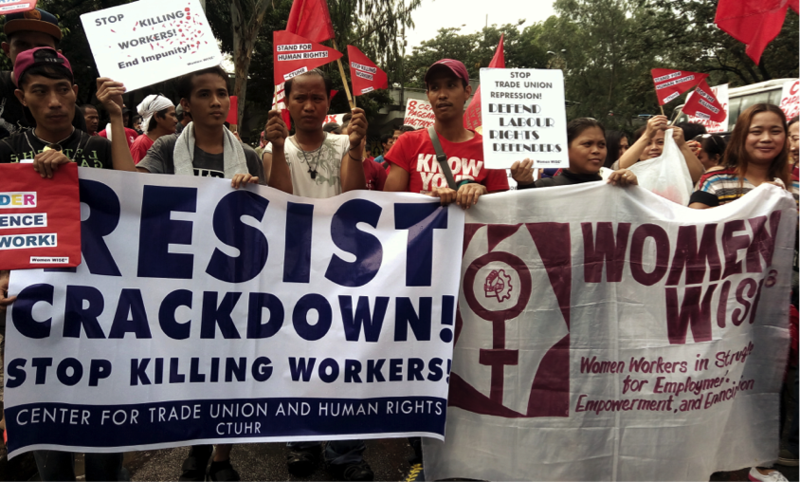 Women in the informal sector, had their first taste of these wars when Merly Valguna and Dorie Mallari were brutally killed in public market in Trece Martirez, Cavite on October 19,2016. Valguna and Mallari were both leaders of Annex Vendors Association of Trece Martirez Cavite. 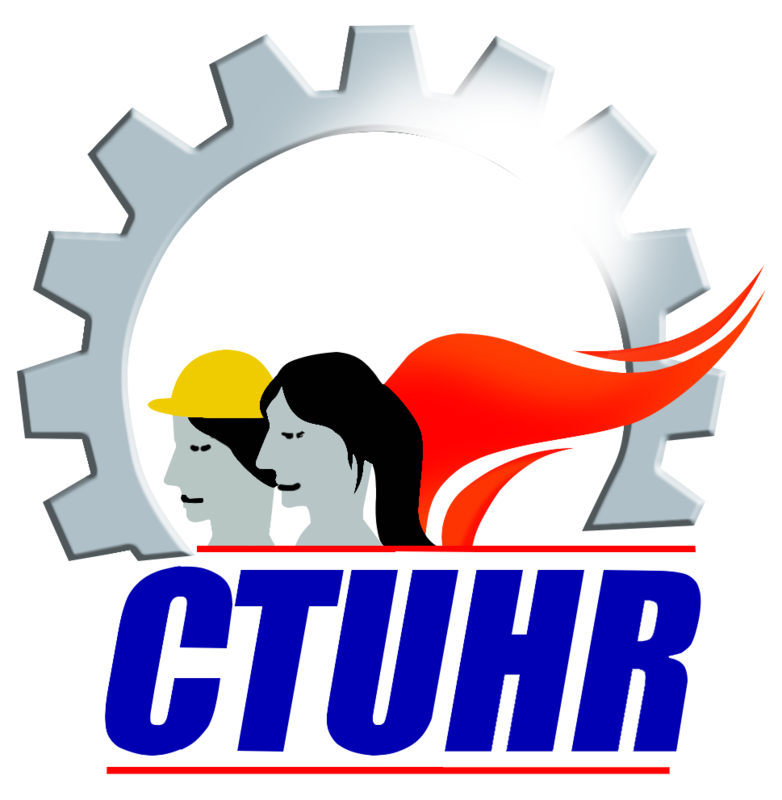 On October 25,2017, Edwin Pura, a transport worker and leader was gunned down in Gubat, Sorsogon. A month prior to that, on September 18, Reneboy Magayano, plantation workers and chairperson of Maragusan Workers Association in Compostela Valley was also killed by suspected elements of 66th IB-Philippine Army. To date, more than a hundred peasants, indigenous peoples, youth and human rights defenders had already been by these costly wars. The latest, the killings of human rights workers, Elisa Badayos of KARAPATAN Central Visayas and Eleoterio Moises, in Negros Oriental on November 28, who were killed while looking into human rights violations in the area as a result of military offensive. This does include the estimated 13,000 victims of war on drugs. KARAPATAN also notes of more than 249 who narrowly survived attacks on their lives as at October 31, 2017. Militarization has doubly intensified, displacing peasants and indigenous communities since Presidente Duterte cancelled the peace negotiations with the National Democratic Front in pursuit of the New People’s Army rebels. These are not what the government simply calls as rebels infested areas, but these are resource rich areas where transnational corporations (TNCs) and their big local capitalist partners are operating or eyeing for expansion of export-oriented plantations, minings and special economic zones. Landlords have also been emboldened to defy the courts granting certificate of land ownership awards (CLOA) to tenants and instead use goons to intimidate and to drive away the claimants. President Duterte’s, himself a self-proclaimed socialist, open threats to crackdown the progressive organizations, those critical of his administration’s policies and those who joined protests and labeling them as destabilizing national economy defy whatever logic there is. The proclamation only give legal justifications for both the military, police and hired goons who all figured prominently in the deterioration and shrinking space for human rights, to continue and intensify the hounding of every organizations and individuals who are considered by the state as enemies. This is not only desperate but flouts the internationally recognized role of civil society organizations and human rights defenders in national development and in knocking the heads of states when they inflict damages on people. The Duterte administration has bared itself completely. Simultaneous to its wars are his administration’s economic policies that will also kill livelihood, jobs of the poor honestly earning a living. For instance, drivers and operators are threatened to kick them out of the streets to pave way for the jeepney modernization program that vehicle manufacturing TNCs and their local partners will primarily benefit. And this amidst the daily breakdown of MRT that increases tensions and blood pressure of commuters. PISTON President George San Mateo has been receiving threats to his life and safety since the successful two-day jeepney strike in October. At the factories and workplaces, capitalists are exploiting the situation are now terminating their workers en masse without notice, evading obligations that come around Christmas. Dong In Entech, a garment manufacturer with 1,200 workers ran away, leaving its workers to find work in other factories in Bataan. Almost a hundred workers of Syncrate Corp, a building contract of big property developers were notified that they no longer have jobs and will only pay their wages. Most workers have been in the company for four-10 years. 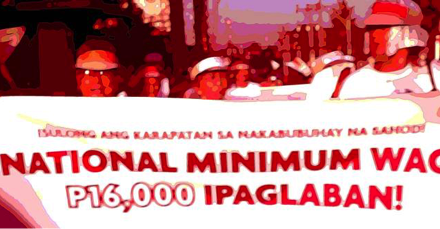 Similarly, workers asserting their rights and claiming what is due them, are dismissed such as the case of Lou Mercado, an account manager of a BPO company, workers at Wellpack Packaging Corporations who filed a case against underpayment legalizing Compressed Work Week is in the offing, so is the legalization of job contracting that will further cut on the already precarious employment condition in the country and will consequently increase unemployment.